Photo courtesy of Nikki N.
Hair stylist found in Japan. Careful with those scissors Eugene. 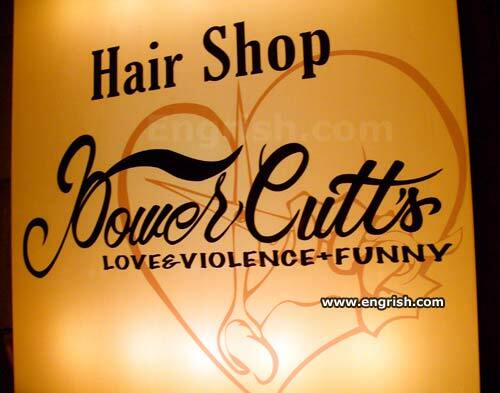 I wanna try that hair shop … must be a hell of a haircut experience waiting for me .. The place where Sweeney Todd shaves off your beard, Edward Scissorhands cuts your hair and you have Johnny Depp pictures on every wall. They may have misheard this song. They f*ck your haircut with a weedwacker and then laugh about it. What a concept for my next TV pilot! For a really close shave, use a Samauri sword. How about a little off the top? Like your whole head? The barber AND butcher of Seville. We’ll have you in stitches! Then we’ll put you in stitches. And switched to maternities solely. Hats off to you! Then heads off! Everyone laugh! Now where’s my FN tip? The scissors are for light trims. For serious cuts we use a chainsaw. It’s all love and fun until the lights turn off. This barber shop kind of looks like a slaughter house…. A Horror/Romance/Comedy AND a haircut!? Now that’s a day out. As long as you keep your hair cutting to the required areas. @iLock: I imagine sitting in a theater watching a horror movie and right as the first person is getting killed, a guy sneaks up behind my seat and starts a haircut. Then I have to change my pants. I remember going to a barber like that growing up. Apparently Freaky Fred from Courage the Cowardly Dog has moved to Japan. Naughty.